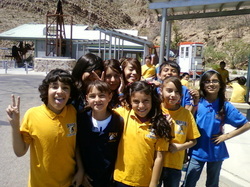 In 2011 the Target Stores Field Trip Grant program sponsored our field trip to the El Paso Aerial Tramway! Sixty students from fourth and fifth grade were rewarded for good work with the field trip that took place on May 26, 2011. The "Soaring to the Top!" field trip was only for the top performing students. A snack and materials were provided by Target stores as well. Thanks to Target, students were able to get a first hand look the plants and topography of the Chihuahuan desert! Michelle Scarantino of the Texas Parts and Wildlife Service visited our school and taught the students about the history of the tramway, the animals, plant names, and other features of the Chihuahuan desert. From the top students were able to see parts of the city, including 3 states and 2 countries.... again.... Thank you Target and Tramway personnel for helping the students of Rusk Elementary!